most rivers I paddle, and I expected to see summer homes along the banks and boats in the water. However, I did not expect the Wakulla to be charming and picturesque, with images that reminded me of a Highwaymen painting. 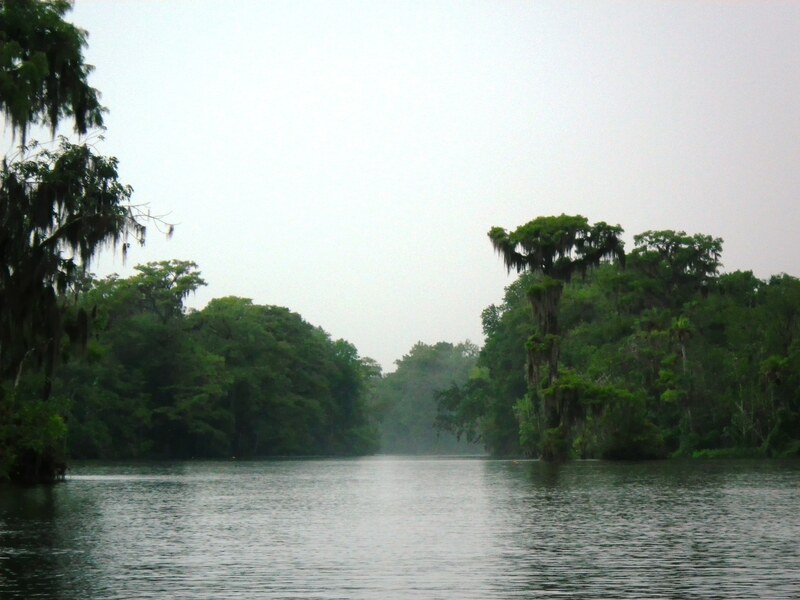 The Wakulla River, both an Official Florida Canoe Trail and an Outstanding Florida Water, begins at the Wakulla Springs, one of the largest springs in the world. It travels about nine miles until it meets up with St. Marks River, and then, just a few miles further downstream, it flows into the Gulf. It’s not possible to paddle all the way up to the springs, as the river is fenced off at SR 365, three miles south of the springs. I put in at the US 98 bridge at 10:45 a.m., renting a kayak from TnT Hide-a-Way. It was Thursday, and I hoped for a quiet morning on the river. I paddled north against a light current, toward the spring. This was an out-and-back paddle, my turnaround point being the bridge at SR 365, about a four- mile paddle each way. Shortly into my trip up the river, I met Josh, a local out for a quick paddle before going to work. Josh, with a passion for Florida outdoors, was scouting out landscapes to photograph. We chatted for a bit, and then he paddled ahead while I continued to discover the river. 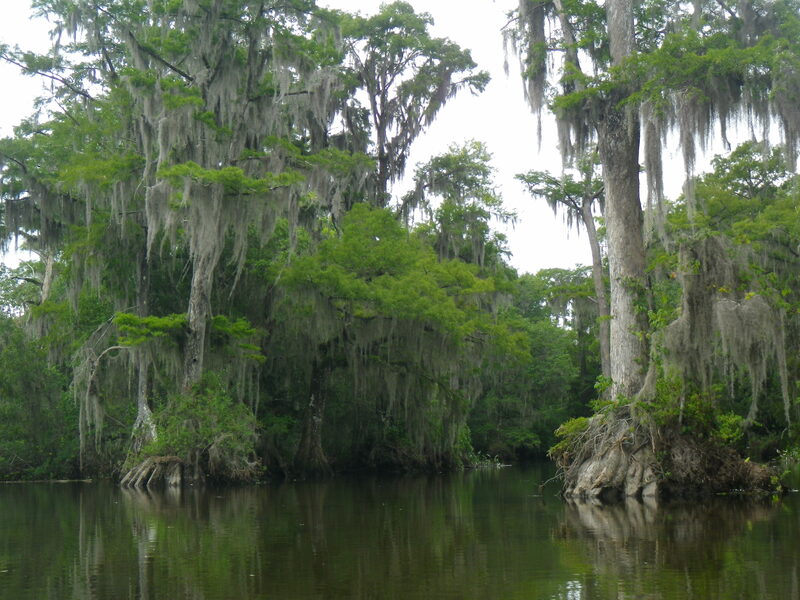 Tall, old cypress dripping with long tresses of Spanish moss graced the edges of the wide river. The water spread deeply into marshy woodlands creating small waterways to explore. Below me, hydrilla and eel grass swayed with the current. Locals dropped fishing lines from small boats and leaned back to wait. As I paddled further, I passed small cypress islands that divided the wide river. I spotted wood ducks in flight and wood duck boxes mounted on trees. Outside one of these islands I paused and watched three playful manatees as they surrounded me, blowing bubbles in the water like children in a bathtub. After all the rivers I’ve paddled, this was my first manatee sighting! I made it to the bridge by noon, greeted by loud rumbles and ominous skies to the north. When it began to rain on my return, I took comfort in seeing other paddlers on the river with me, and when the skies opened up, I was happy to see Josh tucked away under a wooden dock. I joined him, and we lingered together for awhile like two kids huddled in a tiny tent, watching the rain. Then after donning my disposal raincoat—we made a Butch Cassidy break for it and paddled out into the downpour. I couldn’t see far, but how beautiful the river looked in the rain! As we neared the bridge, the rain slowed. I looked back and took a picture just as the rain ended, and we paddled the last stretch.